"A person should not be elected because of his faith, nor should he be rejected because of his faith. Let me assure you that no authorities of my church, or of any other church for that matter, will ever exert influence on presidential decisions. Their authority is theirs within the province of church affairs, and it ends where the affairs of the nation begin. As governor, I tried to do the right, as best I knew it, serving the law and answering to the Constitution. I did not confuse the particular teachings of my church with the obligations of the office and of the Constitution. And, of course, I would not do so as president. I will put no doctrine of any church above the plain duties of the office and the sovereign authority of the law." that it stands to reason that it is in fact a Christian duty to get involved in politics. It is amazing to me however, that this sort of reasoning does not seem to comprehend that the best way for the church to influence the world is to BE the Church, affecting culture from the roots up by living out the ideals of the Church by example and so affecting culture in this way. That's a full time job. That does not mean that Christians should not be unaware of politics and their implications or let themselves be heard especially in the voting booth. What it does mean is that Christians trying to serve two masters must always make compromises that detract from their faith and so participating in worldly, political power games should be done with great caution if at all. Romney shows exactly why is his speech. The faithful of course expected G.W. Bush to do the opposite of what Romney is assuring everyone he won't do.... that being let his faith or religion exert influence on presidential decisions. Of course it is impossible to imagine someones whose religious beliefs, no matter how paper thin or shallow, would not surface at least as moral attitudes or core values in decision making processes. To suggest that they wouldn't is not only bad psychology but... well amoral and/or immoral to boot. I listened to several radio commentators remarks on Romney's speech today. Most of them being so-called conservatives were busy rationalizing Romney's remarks and failed to even bring up the points I raise here. This pretty much confirms for me once and for all that these guys armed with microphones and radio towers are for the most part either not very smart, morally illiterate and/or bankrupt, completely sold out or all of the above. "Each religion has its own unique doctrines and history. These are not bases for criticism, but rather a test of our tolerance. Religious tolerance would be a shallow principle, indeed, if it were reserved only for faiths with which we agree." "There are some who would have a presidential candidate describe and explain his church's distinctive doctrines. To do so would enable the very religious test the founders prohibited in the Constitution." Well, a week or two back I heard some remarks Romney made along these lines after John McCain, an opponent for the presidency, took a shot at Romney's Mormon roots. Romney basically said that to criticize someone about their religion was un-American. All the talking heads on TV that night seemed to agree that this turn of events would work in Romney's favor. Now, they postulated, every time someone asks about Romney's religion or begins to critically analyze the doctrines of his religion and their possible influence on him and his decisions he can now play the "un-American" card. The problem with this sort of thinking is that its ridiculous to assume that if Romney were, say a Satanist, Voodoo priest, u.f.o. Cult member, Muslim, Qabbalist, Scientologist or one of those snake handling, charismatic Christians that it would be inappropriate to ask him about it or ponder the implications it might have for the presidency. Such a concept is, of course, ridiculous. The fact is that Mormonism is not a mainstream belief system either. I will address that more in a paragraph or two. "When I place my hand on the Bible and take the oath of office, that oath becomes my highest promise to God. If I am fortunate to become your president, I will serve no one religion, no one group, no one cause, and no one interest. A president must serve only the common cause of the people of the United States." I question why he would bother putting his hand on the Bible, make an oath or promise anything to God at all. Of what value would it be since he has already stated that his nationalism comes before his religion, his faith and thus before God and that, "A president must serve only the common cause of the people of the United States?" Believe me I understand the principles and advantages of separating the Church and State. I don't need a civics lesson. However, I think its safe to say that a real disciple of Christ is not very well suited to the compromises of governing anything larger than a small community, clan, tribe or village. Its unthinkable in this day and age of mega cultures and megalomania that a meek, humble, non materialistic, non violent, lover of neighbor as self, lover of enemies and deeply committed spiritual person could attain let alone hold the office of president of the USA without selling out his spiritual values to some degree.... like Romney just did. 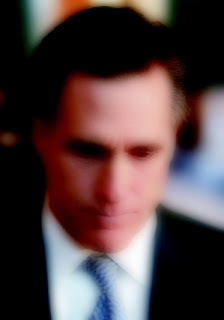 This selling out is also manifested for Romney in the positions he has articulated where he condones pre emptive warfare (which is what the attack on Pearl Harbor was), torture, secret prisons and the contravention of the rule of law not to mention the scriptural mandate to love your enemies and treat everyone as you would be treated with regards to 'enemy combatants" (who are essentially whoever the president decides they are nowadays). He also has resolutely refused to negotiate with enemies whatsoever which is neither wise nor biblical. Separating church and state then, is not only a protection of the value system of the state (AKA in biblical terms "the world") but also a concept that protects the virtue of the Church. I also understand that a person's theology definitely matters, especially when they hold the most powerful office in the world. Theology matters. look at the conflicts in Israel, Palestine, the entire Mideast. All the different groups believe it is they that have the rights to certain blocs of land... it is they that hold the truth... it is they that will survive and triumph with God on their side. On that score Romney's Mormonism frightens me as well. There are doctrines in the Mormon faith which should make everyone somewhat uncomfortable. Mormons believe that the Bible is valid, but that the Book of Mormon is the completion and perfection of the Bible. As a traditional, mainstream Christian I have no problem saying that I have a problem with that. If you look at the skirmishes between the Arab world and the Christian West its safe to say that the beliefs of both sides concerning, eschatology, the end of days, prophecies about the end of the world all play into the geopolitical dynamics of things. This realization is where I got the concept for the title of this blog, Geotheology. The end times doctrine, or eschatology of many Mormons holds the belief that in the "last days" (which a lot of people anxiously ASSUME we are in) a Mormon world leader from the USA will arise and save the nation from complete destruction and set the world to rights. Then Jesus will come back and set up the millennial reign of His Kingdom somewhere in Missouri. I don't know about you, but at this stage of things I am really not comfortable with someone with a hero complex and delusions of glory and pretensions about saving the world though warfare for Jesus, as if Jesus needed help, at the helm of the world's only superpower and with his itchy trigger finger on the button of its nuclear arsenal. "We separate church and state affairs in this country, and for good reason. No religion should dictate to the state nor should the state interfere with the free practice of religion. But in recent years, the notion of the separation of church and state has been taken by some well beyond its original meaning. They seek to remove from the public domain any acknowledgment of God. Religion is seen as merely a private affair with no place in public life. It is as if they are intent on establishing a new religion in America — the religion of secularism. They are wrong." 3 Do not have any other gods before Me. I won't even go into the other commandments that he will undoubtedly break if his ideas on policy, warfare and the treatment of prisoners go into effect with him as president. Think eternally. Act spiritually. Pray Hard. Noam Chomsky comments in the classic movie Manufacturing consent where he vivisects the corporate media propaganda model. Chomsky is one of the thinkers and writers that helped me wake up from the nightmare of the reality constructed by so called conservative politics and the religious right and get my life back on the spiritual track. Chomsky is not a Christian, but his views helped me rediscover the true mission of the Church and to save my mind from perdition. The Message of the Myth: Campbell compares creation stories (Genesis, other religions). This is part #1 of a series. The quest for meaning in life is one that all races of all times have undertaken. It is something that God, the super intelligence that brought the universe into existence, order and harmony, evidently programmed right into the essence of our being. Christians believe that the meaning of life and all existence is revealed in the bible and manifested in Christ alone. However, not all men of all times have been exposed to the Gospel or shall we say the right combination of sound Christian teaching and proper, defensible, truly Christian, moral behaviour. Paul quoted non-Christian poetry when he preached in Athens. "As also some of your own poets have said, 'For we are also His offspring. Therefore, since we are the offspring of God, we ought not to think that the Divine Nature is like gold or silver or stone, something shaped by art and man's devising. "(Acts 17:28-29). "I have become all things to all men, that I might by all means save some." In Athens people were lovers of poetry, art, culture, history and what you would call today "New Age" concepts. When Paul went there to preach he embraced their culture of new age idea's and poetry, and used it to glorify and direct people to Christ. Instead of condemning people's cultures we as Christians today should also be interfacing with different expressions of human culture, and revealing Jesus Christ to those cultures to edify them instead of just judging and condemning them. We as Christians need to become all things to all men, so we can win them to Christ . We are authorized to do this so long as we remain true to the Biblical message in doing so. My friend DSM is already using this concept in the review of the Sun Tzu material here on this blog. One thing I wish to show by reviewing these clips is to show that many of the rifts and disconnects between modern Christian culture and other expressions of philosophy and human quest for meaning are not necessary. Many of these rifts actually come from the misinterpretation of Biblical theology and scriptural interpretation through the lens of socio-political ideology rather than what the Bible actually says or means. I have desired to do this, and have in many ways since the founding of this blog. As DSM pointed out to me in the long lost days of yore, this song really nails it from the perspective of Satan. I love the video remix here.